Wheels for Wellbeing has 8 years’ experience in removing barriers to cycling for those with disabilities, across all age groups. Their aim is to enhance the lives of disabled people, especially those with visual impairments, by ensuring that anyone can access the physical, emotional, practical and social benefits of cycling. They work in partnership with other organisations, including voluntary groups, schools, local authorities or NHS services, private companies, in order to reach out to as many potential cyclists as possible. They use their connection to the London Cycling Scheme to ensure that the facilities and interests of all types of cyclists can be considered, and have a stock of over 30 different non-standard and adapted bikes. Wheels for Wellbeing make cycling accessible by providing the necessary equipment, as well as through the training of pilots to facilitate the actual cycling. 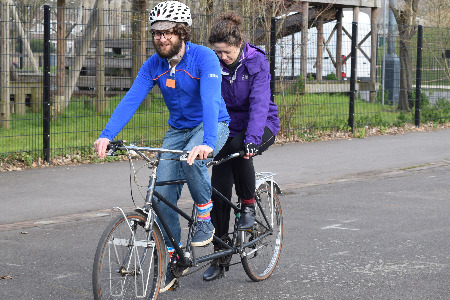 A number of tandem and pilot engagement sessions are being held in parks across London, to enable pilots and ‘stokers’ (the person not steering) to become used to riding these specialised bikes. Following these, there will be led rides, using cycle path infrastructure and quiet routes, to events or sites of interest. These will culminate in attending the Freecycle event during the Ride London cycling weekend in July 2016. "Wonderful opportunity to try tandem for first time ever. Simple organisation and friendly people" – Pilot. The project has been hugely popular and successful, with the demand for places being far beyond what was envisioned. In addition, new events have been added, including usage of the road track at the Velopark and the Velodrome cycling track. “It was very well run and I learnt a lot. Within half an hour you can feel comfortable and confident. I’ve wanted to try riding a tandem for years – this gave me the opportunity” – Stoker. Wheels for Wellbeing hopes to build up a larger group of regular pilots, to make the project available to even more disabled and visually impaired people to take part. Now that they have the equipment and resources, once this group of pilots has been built up, more informal rides and tandem pairings can be put together to enable wider and more frequent participation. To find out more about Wheels for Wellbeing, please visit their website, or follow them on Twitter.